Many people struggle with food cravings. Studies tell us that it's fairly common for food cravings to happen at certain times. When you're trying to lose weight, food cravings can make it impossible to stay on a diet. 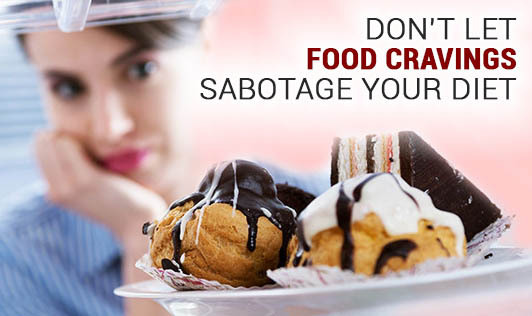 Once you have recognized that you have cravings and how they can sabotage your diet, it is time to get them under control. Do you ever wonder what causes food cravings? People often crave foods with high amounts of sugar, fat and / or salt. What is interesting here is that it isn't hunger that they are feeling, but something more. Two different biological factors influence these cravings - a drop in serotonin levels or adrenal fatigue which influences the craving for salt and sugar. Most food cravings are not about satisfying a nutritional need or imbalance. They seem to be more emotion-related. • If the food isn't available, you can't eat it! Empty the snack jar and keep it away. Keep healthy food choices on-hand. • Recognize the feelings and emotions that lead-up to a food craving. Try to deal with the triggers the best way you can. • Make good use of your support network and share your feelings with someone. • Get enough sleep. When you're tired, you're more likely to crave things. • Exercise. It helps to cut down on your cravings. Try to get at least 30 minutes of physical activity every day. • If you crave for snacks, substitute it with low-fat foods and complex carbohydrates. Example- if you crave for sweets/chocolates eat fresh dates or a sweet fruit instead. • Never skip a meal. Eat at regular intervals and eat low calorie snacks in between meals. • Distract Yourself. Do anything other than cave-in to your desire for food, and keep doing it until the cravings subside. • Eat enough every day - don't drastically cut your calorie intake. You must eat enough to maintain your ideal body weight. Don't go on any kind of starvation diet. • Eat foods with plenty of fiber which fills you up, and keeps you going for several hours.